Love eating fish but dislike all the prep work? This fool-proof Baked Salmon (Ca Hoi Nuong) recipe is a guaranteed winner and a great way to make a tasty and healthy meal for your family. 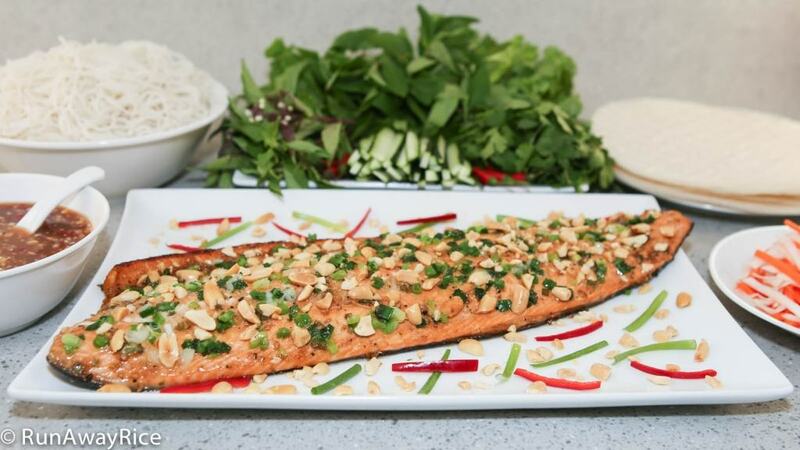 We marinate a whole salmon fillet with an Asian-style sauce and then bake it in a very straightforward way–no fancy gadgets or equipment needed, just some tin foil. The results: perfectly baked salmon that is moist and flavorful! Make it into a meal by serving with rice or potatoes and one or two side dishes or serve as a salad on top of fresh greens. 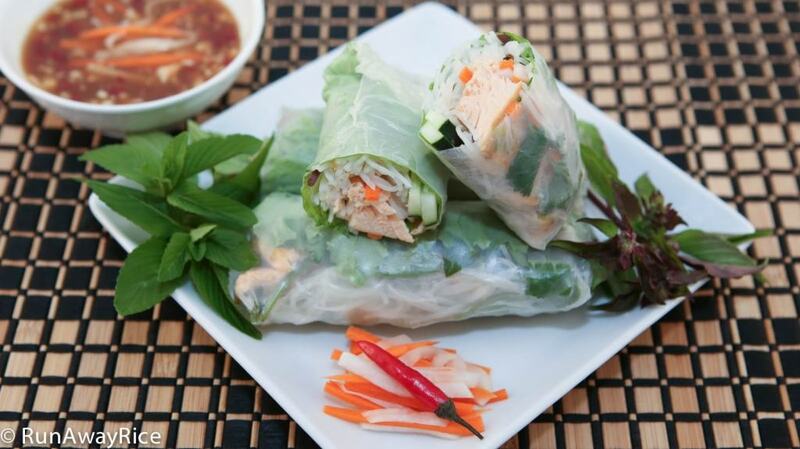 My favorite way to enjoy this baked salmon is to make it into fresh spring rolls. 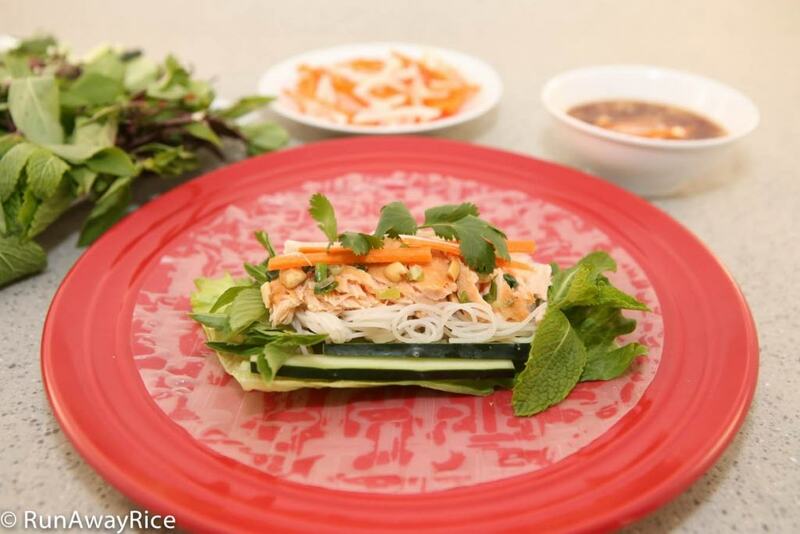 You’ll need Rice Vermicelli, green leaf lettuce, cucumbers, assorted fresh herbs (mint, spicy mint, Thai basil, cilantro, etc. ), Carrot and Radish Pickles, and rice paper. Dip the rolls in the essential Tamarind Dipping Sauce and enjoy! If you enjoy this recipe, you might like: Grilled Pork Patties and Skewers (Thit Nuong) and Steamed Fish and Bean Thread Noodle (Ca Chung Tuong Bun Tau). Peel and finely mince the garlic. Finely chop the green onions. In a measuring cup, add the sesame oil, lemon juice, soy sauce, oyster sauce, and sugar. Stir together until the sugar is dissolved. Add the minced garlic and green onions and mix together. Rinse salmon on both sides with cool water and then pat dry with paper towels. Line a large baking dish with 2 large pieces of foil. Leave excess foil on both sides, enough to be able to wrap the fish later when baking. Drizzle 1 teaspoon of vegetable oil onto the foil and coat evenly. Place the fish skin side down on the foil. Spoon marinade on top of the fish coating it evenly. Sprinkle ground black pepper on top. Marinate in the refrigerator for at least 1 hour. Preheat the oven to 375 degrees Fahrenheit. While the oven is heating up, remove the fish from the refrigerator. When the oven is up to temperature, wrap the fish using the foil from the pan creating a tent. Fold over the ends as well. This will keep all of the hot air in the tent. Bake for 15 minutes. Remove the fish from the oven and carefully peel back the foil. Brush the fish with melted butter. Set the oven to broil and bake the fish for another 5- 7 minutes until it is golden brown. Remove from the oven and allow to cool for 5 minutes. Transfer fish to a serving dish. Top with scallion oil and the crushed peanuts. Serve with the Tamarind Dipping Sauce. Hello chi Trang, I’ve made this dish 2 weeks in a row and still not tired of it yet! California heat is a bit unbearable this summer so this dish ranks right up there with refreshing and healthy dish for dinner. Thank you again for sharing! I am so glad to hear you like this recipe! Yes, it’s been a scorcher this summer and these easy dishes minimize time spent in a hot kitchen. Hope you enjoy the salmon wrapped with lots of refreshing lettuce and herbs. Stay cool! Chi Trang oi, I bought a whole wild salmon ( without the head) at Costco yesterday and determined to use your recipe for it. Despite slicing my finger while filleting the fish, the fish turned out very moist and yummy! Even my 14 year old son commented on the fish being the moistest one he’s ever had. Straight from a babe ‘s mouth! Thank you for sharing the recipe! LOL thank you but you are sweeter & kinder 😉 I really appreciate your kindness of teaching, sharing your recipes with us. Yes, you are right, last week I tried your way and it came out perfect. This week I skipped the sesame oil, oyster sauce & soy sauce, instead I had vegetable oil, lemon juice, black pepper & fish sauce … and it came out perfect too LOL. Ran out of Banh Trang and it became another dish … Bun Ca Hoi! Got any recipe for Tuna Trang? I do have a couple of tuna recipes. I will add to the list for upcoming videos so please stay tuned! Your recipe is a little more exotic than mine. I just spread slices of onion, lime juice & sprinkle with salt & pepper. And of course, top with scallion & crushed peanuts. Thank you, You are very sweet and kind! This recipe is very versatile and your recipe variation sounds delicious. Thanks for sharing and taking the time to post your comments. All the best!